Good morning to you all. And welcome once more to St. John's and especially to Tom Ferguson your new rector, to Shannon his wife, and to Malcolm their son. Please know of our prayers for you as you settle in to your new home, school, community and life here at St John's. You are among friends here. I pray that the bonds of faith and affection will build among you as you extend your arms of welcome on this glad Easter Day. Now then, on to what I call the "Easter Surprise!" My mother and step father, God rest their souls and may peace be upon them, never understood why I wanted to be a parish priest. She, Pauline was her name, was a fiery, feisty, and ferocious spirit, who was capable of making life a bit testy from time to time. He, Homer Kershner, "HK", we called him, was a no nonsense engineer of German stock and temperament and often rather flat footedly told me; "There may be a God but as to eternal life, when you're dead you're dead". I was fond of saying to him; "HK, For living with my mother, you're going to heaven whether you want to or not!". I believe we are all in for quite a surprise! That's what Easter day is all about: the Surprise of God! Even for those of us who believe. After all, when the women came to the tomb they found it empty. Imagine! Grave robbers they supposed! In the "nothing is holy" department, can anything beat that? "We don't know where they have laid him", they said. So off they ran in a panic to report the indignity to the disciples who then came running back in return. Mary asked the one she supposed to be the gardener. "Where have you laid him?" She did not recognize him at first. But when he said her name, there came the recognition that changed everything forever and for everyone. "Rabbouni! ", she cried, which means teacher. She ran off and told the others "I have seen Jesus!" We are all in for quite a surprise. We are all children of a modern skepticism borne of a secular credo whose faith is built around a denial of so much of what we take as sacred. So much so, that sometimes, we find ourselves skeptical of the most foundational of beliefs in our own credo. When we face the suffering and death of our loved ones, for instance, we sometimes fail to point one another to heaven. We sometimes fail to comfort one another with psalms, stories of scripture, hymns of praise. Sometimes we are so riveted in the suffering and in the death of a loved one that we may fail to point to the beyond and the within of heaven. At the very least we know we love one another. So then, remember the love. That's the key to heaven both here and now as well as beyond the grave. This is the essential surprise of Easter. This is the incarnate love of God as lived out in the life, death and resurrection of Jesus. The Love of God was born to us in a Manger and all of heaven and Earth sang. He lived and taught among us. He healed our sicknesses in body, mind and spirit. His love reached out to the poor and the outcast, even to the lepers, the prostitutes and the tax collectors. It was a quite a band of loved ones who followed him. Peter realized that God shows no partiality in his words to us in today's first lesson. We know that right here at St John's, don't we? Eventually the rest of the Anglican Communion will figure that out too! The flesh and blood Love of God came to the Temple and found it defiled by an exclusive crowd of money changers and he overturned their tables and the confrontation between God's Love and the religious authorities of the day was such that he was tried, convicted and sentenced to death upon a cross. In this Holy Week, we have walked the way of the Cross with this Holy One who is the Wondrous Love of God made flesh and blood. And on this day we mark the Amazing Grace and Surprise of his Victory over Sin and Death. It is easy to loose sight of the central Proclamation of the Easter Message. The skepticism of our modern age questions the fact of eternal life which you and I have discovered in the here and now of our Baptismal Covenant. Some think that the last words in life are death, destruction and despair. As the Easter People we know that the Resurrection of Jesus breaks in upon us with the eternal life that forgiveness and resurrection promises. We come to the Empty Tomb of our lives again and again. We may think it is very much the end of it all, but when we peer inside, when we have the courage to run off in panic and tell our fiends about the hopelessness of it all, when we shed our tears and pour out our hearts in despair, someone like a common gardener will appear and speak our name. Then we recognize Jesus. We see him for who he is not just in himself but in the faces and lives of everyone around us. Jesus is not a philosophy or even a theology. Jesus is a person. He is an event. And He is risen! He is the central event of our faith. For as long as there is life there is hope. And even when there is no life there still is hope, for as today's Epistle puts it; "The last enemy to be destroyed is death". Oh yes, you are all in for quite a surprise. Those who go about life as if there is no God and those who in the Name of God commit one kind of violence or another against God's people, those whose greed or self centeredness forget the poor, those who think they can destroy the beauty and the majesty of God's creation; boy, are they and we in for a surprise. For the trumpet shall sound, thank you brass section, and the dead shall be raised incorruptible. Wake up! Not so sure even now? Don't think so? You'll see. How do you think I know such a thing? It is because I know the Love of God made flesh and blood in the person of Jesus Christ our Lord. And so do you! The Lord is Risen indeed. Alleluia! And now finally Cindy and I must say our last "Goodbye". As you welcome Fr Tom, Shannon and Malcolm at the back of the church, Cindy and I will pack up the car and be on our way over the Sagamore Bridge hopefully for the last time for a while. We said our "goodbyes" last week. Say your hellos today and greet your new rector and his family. Please know that the word "goodbye" derives its meaning from an older expression in English which means "God be with you". For the sake of brevity that turn of phrase over time became shortened. The first known use of the shortened form "Goodbye" dates from 1580. The word is a prayer, you see. It is and will always be our prayer that God be with you. Likewise we ask your prayers for us as we journey on. In the Name of God, the most holy, undivided and everlasting Trinity. A meditation for Holy Week. History is what history does as Forest Gump might probably say. Look what it did to Jesus. Now look what it did to folks in Belgium. History goes on. In the very midst of history there is Jesus and the Wondrous Love of God. What Wondrous Love is This! The Passion Narrative tells the story of one of the most poignant moments in the Christian Year. 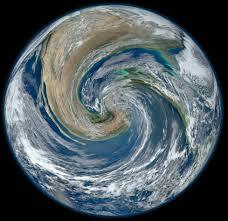 We are all familiar with the reality the Cross points us toward. At one point or another we've all been there. We've all done that. If you haven't yet. You will. No one escapes the inevitable. Our share in the suffering of Jesus on the cross; is it about fear and terror? 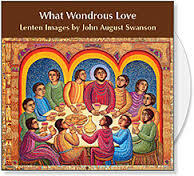 Or is it rather about God's Wondrous Love and the gift of faith? The Passion Narrative explores the emotional, physical, and spiritual exhaustion of the Disciples at the very moment that Jesus found himself in the constancy of prayer. Yes, I know about that. There is the abandonment Jesus experienced as the Disciples distanced themselves from the dangers that Jesus faced with the authorities. Yes, we know about that. Who of us wants to deal with the ugliness of hate and arrogance which now is so prevalent in our public life? Many of us are just quiet about it, since if we say anything, we'll only make matters worse. Then there is the blaming of those we consider the guilty parties. God knows that there are portions of the Church who have done enough of that down through the ages. Recently at a basketball game in suburban Boston a jeering crowd was all too willing to blame Jewish kids for the crucifixion of Jesus. Oh for God's sake! The Passion Narrative moves us in profound ways, because, in one way or another we share in the suffering of Jesus at one time or another in life. As we embrace our share in that suffering, allow me to invite you to embrace the reality of Christ's suffering not so much with the terrors that suffering of necessity inspires, but with yet another dimension; the dimension of faith. How shall we find anything redemptive in the suffering we face for ourselves or others? Allow me to suggest, if I might, the notion of that Wondrous Love we know not only as God makes vividly clear in Jesus, but in the lives of our loved ones as well as ourselves. Forgive me if you've heard me tell this story before, but I need to tell it from time to time for the benefit of my own soul's health. Many years ago, I was summoned to the bedside of a woman from the Church of Mar Thoma. At the time I didn't even know what the Church of Mar Thoma was. It was only later I learned that we, the Episcopal Chruch share full communion with this Church reputed to have been founded by St. Thomas, Apostle to the Church in South India. Whether all that is true or not was hardly the point at the time. I was a priest. I got the call and off I went to the hospital. The room was filled with family. They were all from Madras in South India. I was introduced to the mother. When she saw me her eyes were filled with the recognition of what was happening. It was a look I shall never forget. I was relatively new to all this at the time. But that family taught me something that has helped me ever since. They kept the vigil with their mom. They read favorite and familiar passages of scripture and psalms to comfort their mother. They sang familiar children's hymns such as she had taught them when they were all young. As she loved her children when she dandled them upon her knee, so now the children loved their mother many years later in a hospital room as the inescapable and inevitable moment approached. The eldest brother explained to me that their mom and dad had impressed upon the children the importance of education. Now all grown, the children were doctors, executives, educators and professionals of various sorts in America and the dreams of the parents were now fulfilled by the children in a hospital room in the near suburban Cleveland city of Euclid, Ohio. As the end approached, I read the service from the Book of Common Prayer; "Ministration at the Time of Death". When the moment came, the eldest daughter exclaimed something I shall never forget; "Look, there goes Momee into heaven!" At that moment the brothers, sisters, family and friends all looked up into heaven as if it were suspended somewhere over the mother's bed, there was a paroxysm of grief. They embraced one another and such was the relief and the love in that room that I found myself filled with faith in a way that I had seldom experienced it before. To be filled with such faith at a moment like this is come to understand our Share in the Passion of Our Lord Jesus Christ that even when we feel physically, emotionally and spiritually exhausted, or alone and abandoned, or even angry perhaps with guilt, fear or horror, above all of these realities, we share in the suffering of Jesus on the cross and there is this Wondrous Love that triumphs over all. Such is the Mystery of Passion Sunday and the Events of Holy Week. We know that this is not defeat, that "our lives are not set in a night of gloom but amid the splendors of God's everlasting day." What Wondrous Love is This indeed! In the Name of God, the most holy, undivided, and everlasting Trinity. The Collect of the Day uses the turn of phrase; "that among the swift and varied changes of this life, our hearts may be surely fixed where true joys are to be found." If ever there were a fact of life that would be it! Life goes by so quickly. As my grandmother always said the older we get, the faster time goes by. That's why we stop today to notice something that doesn't change, that place in our hearts and souls where true joys are indeed to be found. For Christians the world over the signature moment down through the ages is the moment we celebrate week in and week out: it is the Holy Eucharist. The Holy Eucharist is a living reminder that the Risen Christ is always among us. It is a reminder of that moment when Jesus and his disciples gathered in the upper room and broke bread together and after supper shared in the drinking of the common cup. Here we are two thousand years later doing the exact same thing as Jesus and his disciples often did and most particularly on that night before he died for us. Something happened that caught our attention in the person and life of Jesus. Who, I wonder is this Jesus of Nazareth, for you, for me and for us? At the very least, he is the healer, the teacher, the one who goes to the outcast. He is the one who suffers and dies that others may live. For Mary, Jesus was the one who touched her life and made her understand how much God loved her. 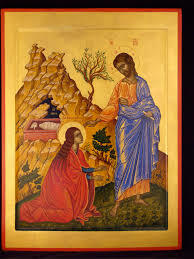 God touched her life again the day he raised Lazarus from the dead. And here in today's Gospel Mary touches Jesus' life when she anoints his feet with very costly perfumes. The fact that Jesus allows this to happen seems somewhat over the top for the one who went out among the poor and the outcast, Mary herself being one of those questionable sorts Jesus reached out to. Such was her love and affection for Jesus that she extravagantly and intimately expressed that devotion by washing his feet with her hair. She offended Judas we're told. He thought that the money could have been spent among the poor. Mind you, the Gospeller notes parenthetically that he really didn't care about the poor. In fact there were questions about how honestly he handled the common purse which he held on behalf of the disciples. We are told that the Passover was approaching. They were at the home of Lazarus; the one Jesus raised from the dead. Good Lord, here he is throwing a dinner party for Jesus in Bethany just a stone's throw from Jerusalem. Jesus told these people that he was going up to Jerusalem where he would be killed by the religious and state authorities. They didn't really want to face the facts. For them the swift and varied changes of this life were very much upon them. So preoccupied were they with their lives that they really could not notice that the love of God as fixed in Jesus was the only true constant joy in their lives. The love of God and his power over sin and death was about to be revealed. But they were too busy to notice. I suspect the same is true for us much of the time. After all, the stresses and strains of modern life are very much upon us. Such were the swift and varied events leading up to the cross; that they were hardly able to notice that the one thing that remains unchanged and unchanging is his love, his enduring, forgiving and reconciling love. I suspect that Mary had an inkling into this enduring truth. 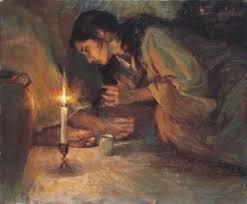 It was because of what Mary saw in Jesus that she washed his feet with her hair. She wanted Jesus to know how much she loved him. The Holy Eucharist is a sign of this love. It is a love that goes both ways; God's love made known to us in Jesus and our love made known to Jesus and to one another in the breaking of the bread. 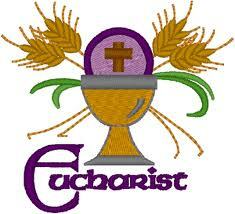 You will notice that the breaking of the bread takes a prominent place in the Eucharistic drama. The breaking of the bread is the liturgical act in the Eucharist that recognizes that we are all broken in one way or another and yet we are all healed as well by the ever fixed, constant and eternal love of Jesus Christ our Lord. Our relationships with God are broken as are our relationships with one another. The breaking of this bread allows us share in the love of God even in the midst of all the swift and varied changes of our history. The breaking of this bread allows us all to "forget what lies behind and to strain forward to what lies ahead, as we all press on toward the prize of the heavenly call of God that we have heard in Jesus Christ our Lord". That's how Paul puts it in today's Epistle. And that's why we break this bread. That's why we drink this cup. The grace of this Eucharist gives us the wherewithal to press on. Jesus becomes present to us in this meal, as does his love for us. Here we can come to the altar rail and pour out our hearts. We can share our fears and ourworries with God. We can share our gratitude and our thanksgiving. We can express our hopes and our joys. We can offer ourselves to God for the purposes of God in our lives. We can kneel there and ask God, what do you have in mind for me next? God know's I ask that question at this altar in these last few weeks I have with you here at St. John's. Here at this altar rail we can be reconciled to God and to one another. The breaking of this bread reminds us too that we are all one family on this day, whatever else anyone can say, today we are one family under God. And we can thank Julia Caroline Whte for making this day possible. It's not just your family that is gathered here. It is all of God's family. You are very special to us today. This is a very special day for you but not you alone. This is a special day for all of us. Sorry for centering you out Julia, but it is you who make this day so very special indeed. Thank you. That's it! This is the very core of our faith. The unchanged and unchanging fact of faith. And our very lives remain fixed on this one fact. Empires come and empires go, but the Risen Christ remains true and fixed in our hearts. It is there with the Risen Christ that true joys are to be found. Fix your hearts there. Nothing can ever change that one fact, because nothing can separate us from the love of God which is in Christ Jesus our Lord. Yes, the Apostle Paul said that too. I want to extend a special welcome to your family gathered here today, and welcome back everyone in the family to this very special moment in your life and in the life of this congregation. We welcome you all because we believe that God is about to do something new here. God is about to touch Julia's heart in a whole new way. Do you not perceive it? or consider the things of old. now it springs forth, do you not perceive it?" As that applies to me, so too it applies to us all. Do you not perceive it? At every moment of our lives, God is about to do something new. 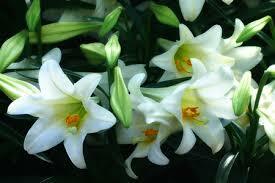 Julia, as you come to the altar rail today with your family, may God's spirit touch you in a very special kind of way. I feel so privileged that you have asked me to do this particular thing today for you and your family. It pleases me to know that such is the bond of affection that we share that we can also share this moment. Ah but something else is about to happen within a few short weeks. I wish I could be part of it. But alas God wants me to move on to something else. I'm not at all sure what that something else is right now but I do know God wants something more out of me. God is nowhere near done with me yet. I will take a few weeks off to watch the tide come in and go out from my perch on my porch in Lynn. But as sure as there are varied and swift changes afoot in life at large, so too there are swift and varied changes afoot in my life as well and it is the Living God who is stirring within me, and not just me but all of us. I hasten to add that I will not be able to come back when I leave. Just ask Fr McGin about that one. When your new rector comes he will be your new rector. Fr Paul and Fr John will both be part of your history. And that's just the way it is. If you want, you can come and visit me in Lynn, or meet me in Boston and we can have a bite to eat for lunch or I can take you on my nickel tour of the city. But we cannot talk St John's church business. We can only talk about our friendship and our shared journey in Christ. That's where our true joys are to be found and we can always talk about that. That's just one of the facts of life in all the swift and varied changes that come and go. There are many joys and God knows some sadness, and pain in all this too. In the Name of God, the most holy, undivided and eternal Trinity.